Long known for its distilled spirits — both legal and otherwise — Central Kentucky is the perfect place to learn a little about the distillation process, sample a shot or two, and enjoy the bucolic scenery along the way. In fact, if you want to stay on the well-trodden path, you can easily visit the six large distilleries on the Kentucky Bourbon Trail (www.kybourbon.com) in two or three days. If however, you’d like to get the real flavor of the area, you’ll need to mix it up a bit. 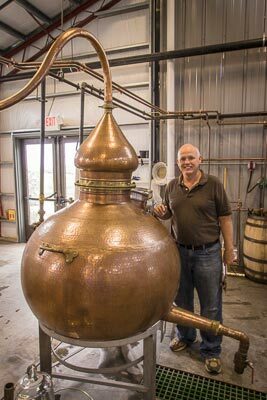 Start out with a few of the large distilleries on the trail, then add in a small moonshine distillery and a newly-opened winery in rural Marion County. Not only is this a very scenic and low-key tasting itinerary, but it’s also a good option for wheelchair-users and slow walkers. Located in rural Lawrenceberg, Wild Turkey Distillery (502-839-4544, www.wildturkey.com) produces one of the best selling premium bourbons in the world. The plant is massive — so much so that visitors are shuttled around the campus on a tour bus. That said, there’s still an ample opportunity to get a close look at the distillation process. The tour begins at the Visitors Center, which has level access and plenty of room to navigate a wheelchair. There is an accessible family restroom inside, with plenty of room for a wheelchair; however it lacks grab bars. There is no charge for the tour, but you must sign up at the front desk. From there, the bus takes visitors to the distillery; however if you can’t climb the stairs on the bus, you can follow along in your own car. The first stop is the still house, which has level access and an elevator to the second floor. Visitors are first shown a movie about Jimmy and Eddie Russell and the history of Wild Turkey, and then invited to take a gander at the mash room through the adjacent window. Along the way the tour guide explains the distilling process and answers questions about bourbon. Then it’s back on the bus for a short ride to the barrel warehouse, which is located next to the original plant. There’s ramp access to the building, and it’s fun to see all the barrels of whiskey piled high. Last but not least, it’s time for some whiskey tasting back at the Visitor Center. It’s a fun and informative tour, and you just can’t beat the view from the barrel warehouse. It’s important to note though, that the plant shuts down from July to September. Although tours run year round, they may be abbreviated in the summer, due to the maintenance schedule. Located about an hour south of Wild Turkey, Maker’s Mark (270-865-2099, www.makersmark.com) is a required stop on any Kentucky distillery tour. This Loretto-based distillery produces distinctive bottles of bourbon sealed with red wax. Unlike the Wild Turkey tour, the Maker’s Mark tour is largely a walking tour. The tour begins at the Visitors Center, which is a re-creation of the TW Samuels’ family home. There’s level access to the building with good pathway access to all the exhibits. Although the tour is free, you have to pick up tickets at the front desk. From there a guide escorts visitors over to the still house, located a short walk away along a paved pathway. Along the way you’ll pass the Quart House, which is believed to be the oldest standing liquor store in the U.S. Built in 1889, it’s where the distillery used to sell bourbon to its neighbors. They’d just bring in their quart jars for refills. Although there are steps up to the still house, a stair lift is also available. There is however, a six-inch step at the entrance, that some folks may not be able to navigate unassisted. There are also two-steps up into the fermenting room, but you can certainly look inside without entering it. Still, you have to be able to stand to look inside the mash tanks. The most interesting part of the tour is the bottling room, where the bottles are hand dipped in red wax. Although there are two steps at the main entrance, there is ramp access just around the corner. The bottling line only runs during the week, so try and time your visit to see it. The tour concludes in the tasting room, which has level access. Tours are offered year round, except for Sundays in January and February. Don’t forget to stop by the gift shop after the tour, where you can buy and hand dip your own bottle of bourbon. There is one accessible dipping station, but you have to be 21 to dip. Round out your Kentucky tasting experience with a stop at Limestone Branch Distillery (270-699-9004, www.limestonebranch.com), just down the road in Lebanon. Founded by Steve and Paul Beam, this new distillery produces legal moonshine, just down the road from where their great-great grandfather made sour mash whiskey in 1836. Access is good at the distillery, with accessible parking, level access to the front door, accessible restrooms and plenty of room to navigate a wheelchair inside. Opened in February 2012, the site serves as both a production facility and a tasting room. Says Steve Beam, “Moonshine is a very broad category, and everybody has their own recipe. We make an Appalachian style shine here, and it’s legal because it’s taxed.” Location plays an important role in the production process too, as there’s an abundance of local grain and limestone water here — both of which are essential to the Beam family recipes. Visitors are welcome to have a taste of moonshine and sugar shine. The variety depends on the season, as Steve and Paul are always whipping up a special brew, like pumpkin shine in the fall. After you’ve had a taste, take a look at the 150-gallon copper pot still in the adjacent production facility. There’s level access throughout the area, and it’s fun to see the equipment and learn about the production process. After you’ve talked with the Beam brothers, you’ll have a real feel for the history of the area, as they truly love to talk about their family distilling history. It’s the perfect way to top off a Central Kentucky spirit tasting tour. To be honest, it would be difficult to fit all this tasting into just one day, so it’s best to overnight in Lebanon to break it up a bit. 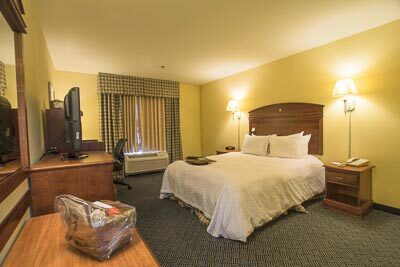 The conveniently located Hampton Inn (270-699-4000, www.hamptoninn.com) is the perfect lodging choice, as it offers good access, a friendly staff and reasonable rates. There is accessible parking near the entrance, with barrier-free access to the front lobby. Room 102, which is located on the ground floor near the lobby, is a good choice for wheelchair-users and slow walkers. Access features include wide doorways, a lowered peephole, an adjoining room and drapery wands within easy reach. 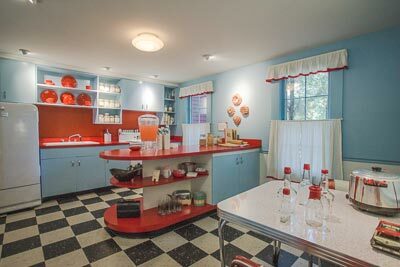 It’s furnished with a 25-inch high queen-sized bed with wheelchair access on both sides; and if you want to dine in, there’s also a microwave and a refrigerator. 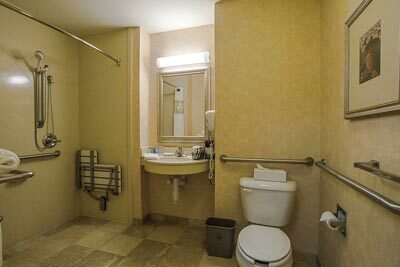 The bathroom is equipped with a roll-in shower with grab bars, a hand-held showerhead and a fold-down shower bench. The toilet grab bars are on the left and back walls (as seated), and there’s also a roll-under sink in the bathroom. Best of all, they even remembered to lower the robe hooks. There’s good access to all of the public areas, including the lobby, where a free breakfast buffet is served daily. 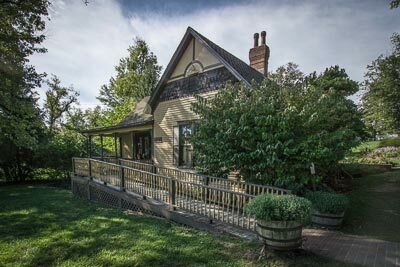 It’s a clean, comfortable and accessible property; and a great place to come home to after a long day of touring and tasting in the heart of Kentucky.